The English translation given above is taken verbatim from Baidu Fanyi. At least the translator got "zhìlì (lit., "knowledge / wisdom benefit / interest / advantage / profit") right as the transcription of the name "Chile". Where it went went wrong is in splitting up "yǒuhé 有核" (lit., "has pits", i.e., "with pits; pitted") into "has" and "stone / pit / kernel / nucleus". Xī méigān 西梅干 ("Western dried plums", i.e., "Western prunes"). If prunes are "unpitted" are the pits still in there, or are they removed? I find it hard to tell. As to the Chinese, is "Zhìlì yǒuhé xī méigān" a relative clause? Or does Chinese allow a sentence as a product description? I'm pretty sure that English does allow that. In fact I find even nouns with relative clauses to be poor as product descriptions in English. I wrote: As to the Chinese, is "Zhìlì yǒuhé xī méigān" a relative clause? Or does Chinese allow a sentence as a product description? That was obviously a stupid question, since "xī méigān" is the head noun here. (gap)-wearing-yellow-clothes-的-that-person "that guy [who is] wearing yellow clothes"
yellow-clothes-的-that-person "that guy with the yellow clothes"
you-should-do-的 "what you should do"
If you see a Chinese speaker use the English clitic 's in what seems to be a bizarre way, they are probably thinking of 的.
I'm with Philip Spaelti in wanting to know if the stones are still in the prunes or not. In British English pitted means that the stones have been removed, but I don't know if that applies in other regions. The post does note that the Chinese means literally "has pits", which is how the translation went astray. That's quire unambiguous. @Ellen: the post says “(lit., "has pits", i.e., "with pits; pitted")”. Linda, Philip, & I are confused because “pitted” generally means “has had the pits removed”, so can’t mean “with pits”. Perhaps Victor meant to write “(i.e., “with pits, unpitted”)”? According to Dictionary.com pitted (in the relevant sense) can only mean having pits removed. (The other sense, having pits, only applies to "pit" meaning "hole"). My intuition agrees with this. This is similar to how "peeled" works, although something can peel (lose its "peel") on its own (intransitive), while there is no intransitive "pit" in this sense. Regardless of how pitted is actually used, the statement that the Chinese means literally "has pits" makes it clear that these have pits. And we do, after all, know that words such as pitted, as a group, are ambiguous as it if they mean "with" or "without", and some individual words are even ambiguous. If you want to correct Victor Mair's choice of English word, fine. But there really isn't any ambiguity here on if they have pits or not, which was the question posed by a couple commenters. Sometimes ambiguity is an inflammatory issue. Man, this translation is the pits. 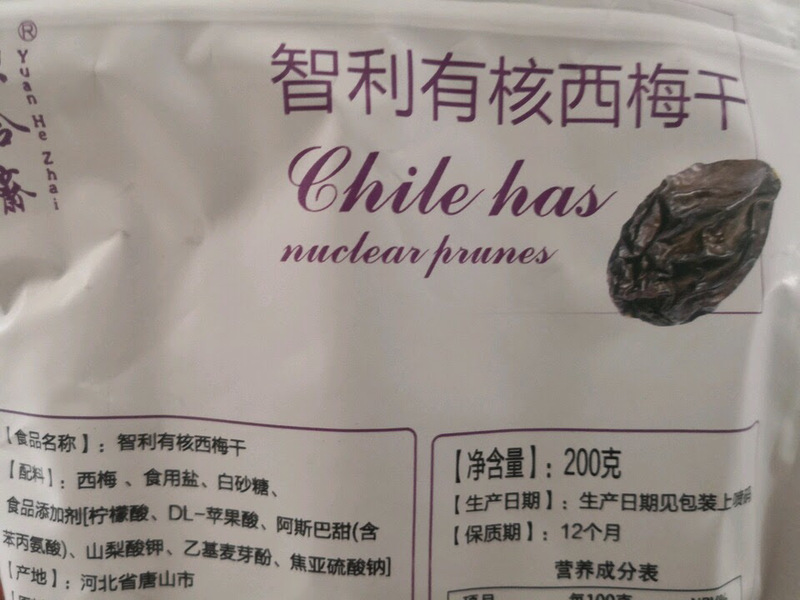 Yes, the Chinese is quite explicit that the prunes have pits, and this is noted in the post. The translation "unpitted" derives from the verb pit, meaning to remove the pit from a pit-bearing fruit. This hasn't been done to the prunes. The gloss "pitted" derives from the noun pit, in the same way that you might describe a monster as being "two-headed" or "three-eyed". Guess what else has a core (yǒuhé 有核). Pitted has always meant to me "without pits" so here I would expect "unpitted." US, get most of my usage from Western Pennsylvania. That answers part of my question, UK and US usage don't differ in this case. And pitted doesn't appear to be one of those words like ravel which mean both one thing and its opposite. Just to be clear, I understood full well that the prunes being sold have the pits in, and I wasn't criticizing Victor's phrasing. I was really wondering about the English. @Linda: "pitted" does not seem to have both meanings, but "unpitted" does. "to pit" and "to unpit" seem to mean the same thing. Ha, i get it! "has nuclear" = has its nucleus = has pits. Took me a while. I was taught that when 核 means a pit in fruit, we always say Hu2 instead of He2.